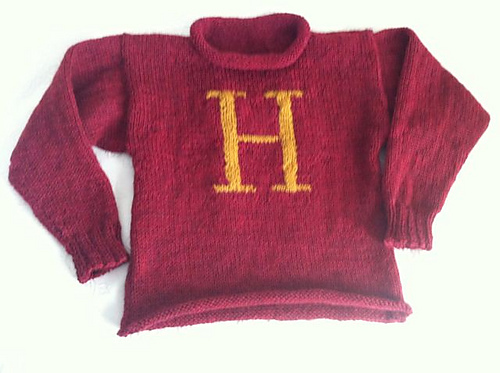 I knit these eons ago for Peep #1 who is a die-hard Harry Potter fan. They were my first attempt at knitting intarsia and I was pretty pleased with the results, even if they were really big for his skinny little wrists. The pattern is here. 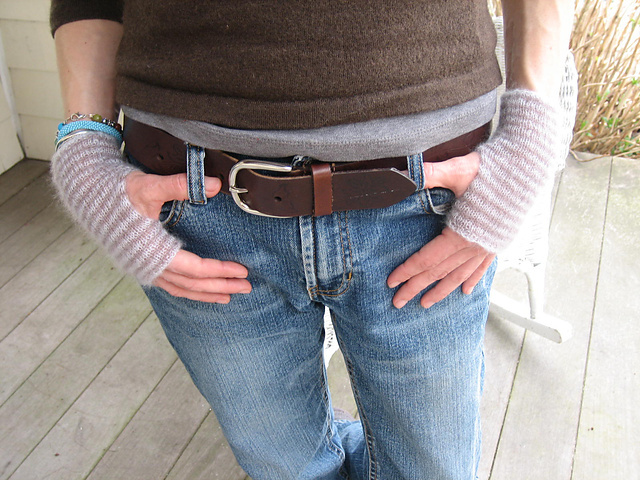 Immediately after seeing Tim Burton’s Alice in Wonderland remake, I went home and did a mad search for a pattern like the wristlets Alice wore as she tumbled down the rabbit hole. Success! 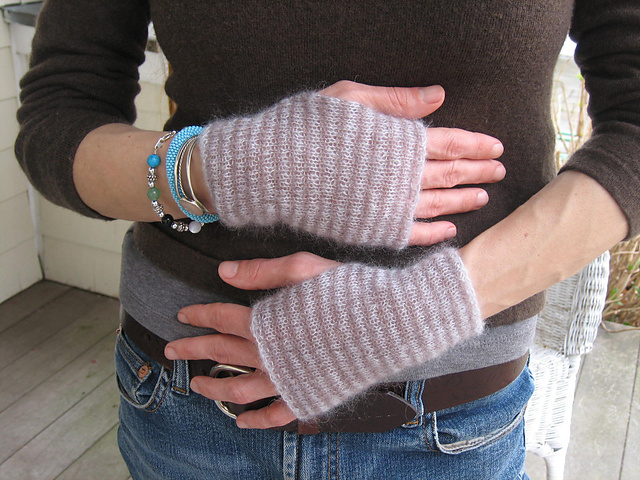 I love Stephanie and Tiny Owl Knits; so many beautiful, magical creations– if you haven’t visited her site yet, I highly recommend it. 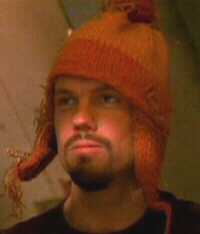 Firefly hat! This is definitely my favorite nerdy knit to date. 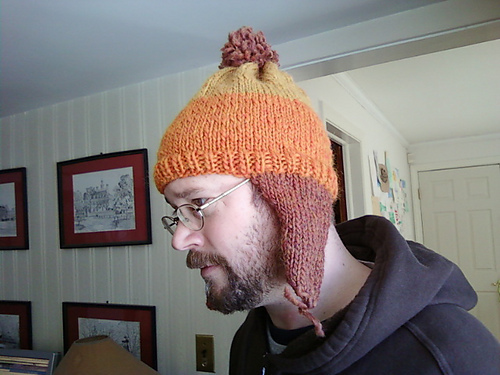 I spent a lot of time trying to find the perfect yarn for this… I wanted it to be as close to the original Jayne hat as possible, and many of the versions I saw had colors that were too bright. So after much agonizing I chose Mauch Chunky in Spice, Pumpkin, and Butterscotch. 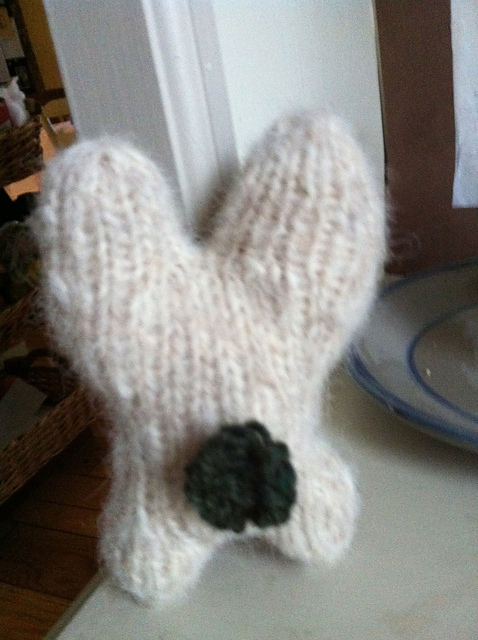 Unfortunately it was MAD ITCHY, so I sewed in a nice fleece lining. DH loves this hat and he gets a lot of compliments on it. One of these days I need to make one for myself! 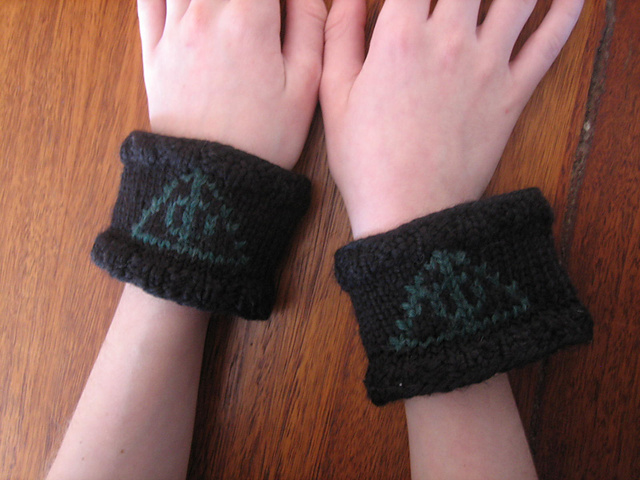 Perhaps I should confess that I am just as big a Harry Potter fan as the kids… if not more. I loved all the books (and movies) and still re-read the books whenever I feel like spending more time in that universe. Since every time I take one of those online “Which Harry Potter House do you Belong In”-type quizzes, I get Ravenclaw, when it was time to knit a scarf for myself it had to be a Harry Potter House scarf in Ravenclaw colors (films, since I prefer grey and blue to blue and bronze). I used an awesome merino called Valley Yarns Amherst in navy and light grey, that is super soft, not at all itchy, and because it’s knit in the round and blocked flat, is super squishy and warm to wear. I had some yarn left over and made this “Ravencowl”, inspired by another Raveler. 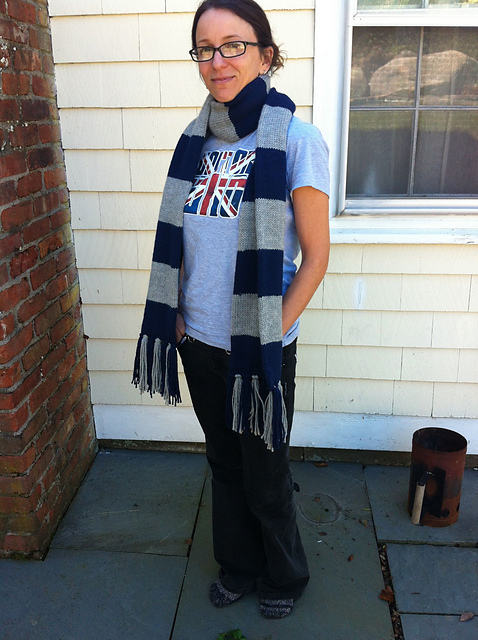 Basically, I just knit four blocks of the scarf (alternating 2 blue, 2 grey) and seamed it together. I wear this all the time around the house. 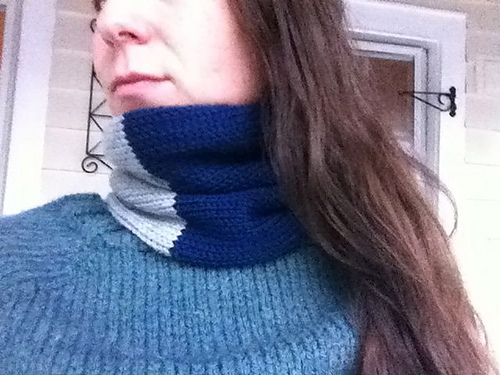 It is SO warm and because it’s a cowl and not a scarf, it doesn’t get in the way when I’m doing things. 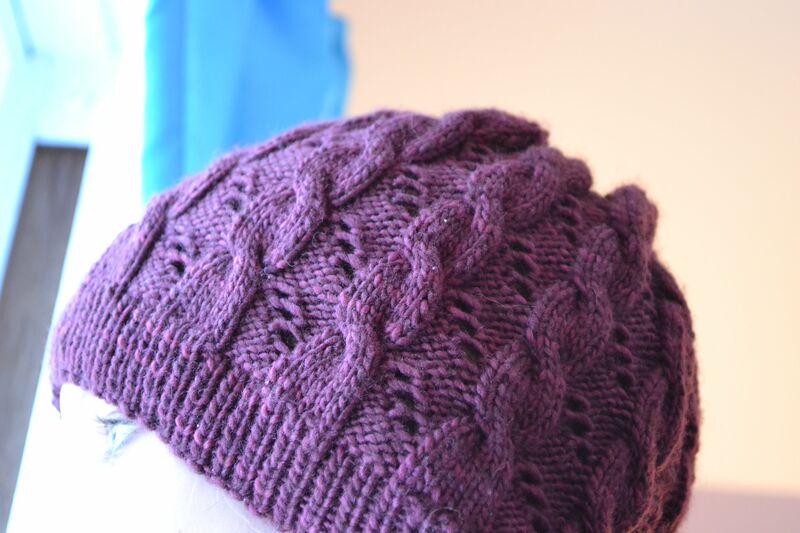 And finally, my most recent accomplishment– the Hermoine Hearts Ron Hat. 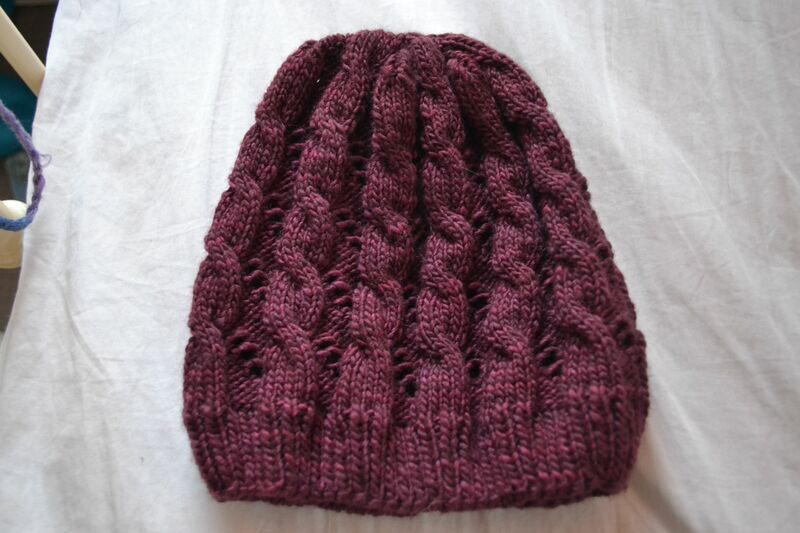 It’s a replica of the Hat Hermoine wore in the Halfblood Prince movie (above). I used Manos del Uruguay Silk Blend but not in the same color as Hermoine’s. I may do another in grey at some point. To my delight a book actually exists called Knits for Nerds. DH gave me a copy for Yule this year, so I have pages and pages of more geek knitting to look forward to. What’s up next? Perhaps a pair of furry knit Hobbit feet. 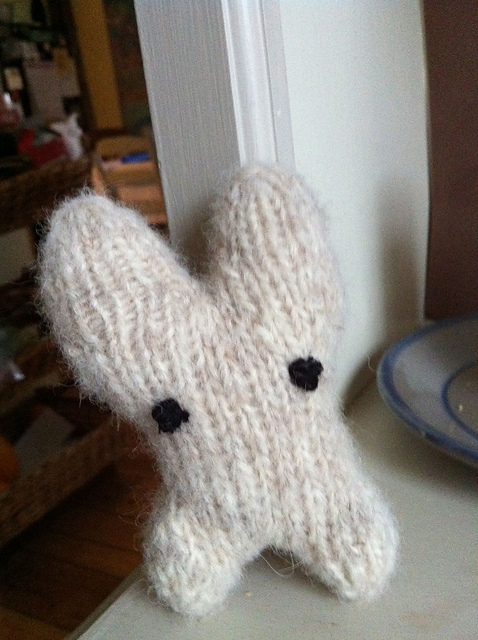 This entry was posted in Knitting, Sci-fi. Bookmark the permalink. Good idea! Even if I don’t find something right away, I’ll have fun looking! !